In witnessing what’s looking more and more like the Great Yankee Collapse of September 2012 (The Mayans predicted it, right? ), I keep thinking back to 1978, the great long march comeback from 14 1/2 games behind in July, the Red Sox implosion of August, and the amazing reliability of Ron Guidry that season to go out and win game after game. Guidry’s career season of 1978 remains phenomenal. 25 wins, 3 losses. A great number of those wins came after Yankee losses. A lot of them ended Yankee losing streaks. He won 13 games in a row before losing one in July. The guy was virtually unbeatable. I don’t think any pitcher has dominated the league as much since Guidry’s ’78 season, something that evoked the way Bob Gibson totally shut down his opposition in 1968, even forcing a rule change about pitcher’s mound height. I got to see part of it in person when he 2-hit shutout the Red Sox about this time in ’78, after the Yankees had caught them and moved ahead in the standings. Got to sit a few rows right behind the dugout on the first base line, thanks to my friend’s Providence cop dad gonnections for primo tickets in the middle of a pennant race. The Sox battled back throughout September, forcing the legendary playoff game that led up to that fateful Bucky Dent-enforces-the-bambino’s-curse at-bat. You know the rest. They never would have been there without Guidry. 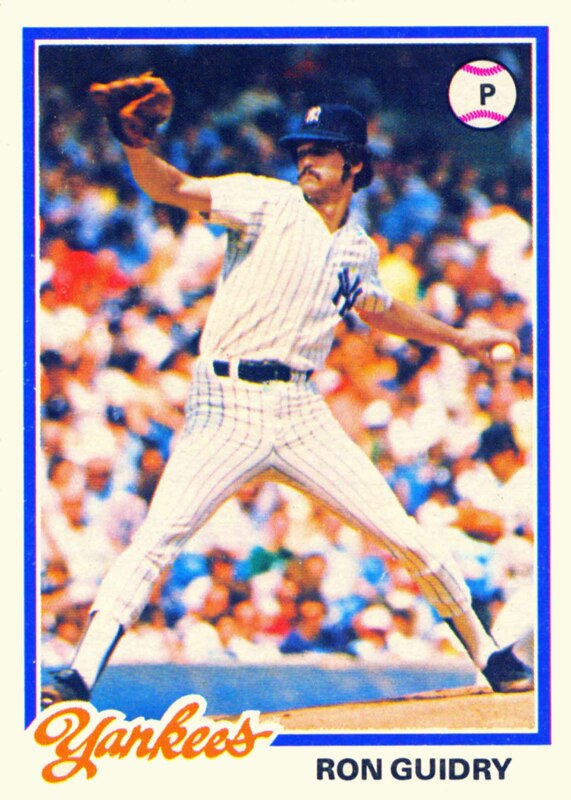 My favorite player from that late ’70s Yankee team. They gave him the Cy Young, but not the MVP he deserved. Jim Rice got that, sorta like when Scorcese finally won his Oscar but for the wrong movie. And where is that kind of performance on the 2012 Yankees? Well, it’s either left on base during any number of failed non-rallies inbetween make-or-break home runs, or it’s on what’s been a large revolving door of a disabled list all season, one that’s catching up with them down the homestretch where they’ll be battling the Rays and the (WTF?) Orioles for a playoff berth. And even if they make the post-season, their season-long inability to win games without hitting a ton of homeruns will, I think, be the killer. There’s no stopper on the mound. No go-to victory guy. Kuroda and Sabathia have both tried as the workhorses, but it’s falling short. I have a strong feeling that my October will be mostly football this year. Enter your email address to follow Professor Wagstaff and receive notifications of new posts by email. Why Is Ben Watson Spamming Me? This work by jimberkin.com is licensed under a Creative Commons Attribution-NonCommercial-NoDerivs 3.0 Unported License. Based on a work at jimberkin.com.